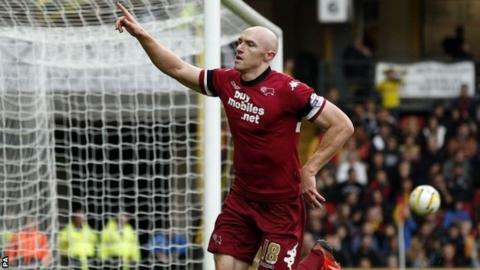 Conor Sammon scored a last-minute winner as Derby boss Steve McClaren led the Rams to victory against his former club Middlesbrough. Boro played most of the match with 10 men after Curtis Main received two bookings, and they went behind when Chris Martin prodded home. Dean Whitehead lashed in an unlikely equaliser with 16 minutes left after fine work from Mustapha Carayol. But the Rams pinched it when Sammon latched onto a bouncing ball to score. Derby's fourth straight win lifts Steve McClaren's side to fourth in the Championship table. When the former England boss took over at Pride Park, the Rams were 14th. McClaren, in his first managerial game against his old club, saw his new team emerge somewhat fortunate victors as the Rams extended their winning run to four matches. After a slow start, the pendulum swung Derby's way in the 33rd minute when Boro striker Main left his foot in on Rams defender Jake Buxton and was shown a second yellow card. Boro's Albert Adomah then had a shot saved after a fine solo run, before Derby took the lead in first-half stoppage time when Craig Bryson's low cross was converted by the sprawling Martin. The visitors levelled when Carayol ran the length of Derby's half and cut the ball back to Rhys Williams, whose effort rebounded for Whitehead to drive home his first goal for the club. Derby struggled to muster a response, but they snatched victory at the death when Sammon beat stranded Boro keeper Shay Given to end a gritty rearguard action. "It's three points. That's it. It was not a good performance by our normal standards. "The Championship is tough and there are different ways you have to win. We won it despite not playing our usual brand of football and we were disappointing in that. "I wouldn't say we were lucky as we kept our patience. We waited for the moment and took it. They're the kinds of things teams have if they're going to be successful." "To concede goals at the end of both halves, we felt bad. I saw I have a team that is together, everyone was helping each other and fighting the same battle and I was very happy about that. "It was very encouraging. When you lose the way we did, you cannot really say anything to the players. "I would like to know why (Main) was sent off. If he deserved two yellow cards, then you would be ending every game with six or seven players." Match ends, Derby County 2, Middlesbrough 1. Second Half ends, Derby County 2, Middlesbrough 1. Substitution, Middlesbrough. Daniel Ayala replaces George Friend because of an injury. Goal! Derby County 2, Middlesbrough 1. Conor Sammon (Derby County) right footed shot from the centre of the box to the bottom right corner. Assisted by Will Hughes with a headed pass. Corner, Derby County. Conceded by Rhys Williams. Substitution, Middlesbrough. József Varga replaces Albert Adomah. Attempt missed. Jamie Ward (Derby County) right footed shot from outside the box is close, but misses to the left. Assisted by Craig Forsyth. Rhys Williams (Middlesbrough) is shown the yellow card for a bad foul. Foul by Rhys Williams (Middlesbrough). Attempt missed. Will Hughes (Derby County) left footed shot from outside the box is high and wide to the left following a corner. Corner, Derby County. Conceded by Shay Given. Substitution, Derby County. Conor Sammon replaces Craig Bryson. Attempt blocked. Mustapha Carayol (Middlesbrough) left footed shot from outside the box is blocked. Assisted by Dean Whitehead. Substitution, Derby County. Johnny Russell replaces Simon Dawkins. Goal! Derby County 1, Middlesbrough 1. Dean Whitehead (Middlesbrough) right footed shot from the right side of the six yard box to the bottom right corner. Assisted by Richard Smallwood. Attempt blocked. Rhys Williams (Middlesbrough) right footed shot from more than 35 yards is blocked. Assisted by Dean Whitehead. Attempt saved. Jamie Ward (Derby County) right footed shot from the centre of the box is saved in the bottom right corner. Assisted by Simon Dawkins. Attempt missed. Jake Buxton (Derby County) right footed shot from the centre of the box is too high. Assisted by Jamie Ward with a cross following a corner. Corner, Derby County. Conceded by Jonathan Woodgate. Attempt blocked. Jamie Ward (Derby County) right footed shot from outside the box is blocked. Assisted by Craig Bryson. Offside, Derby County. Jake Buxton tries a through ball, but Craig Forsyth is caught offside. Corner, Derby County. Conceded by Kei Kamara. Attempt blocked. Jake Buxton (Derby County) header from the centre of the box is blocked. Assisted by Jamie Ward with a cross. Corner, Derby County. Conceded by Richard Smallwood. Dean Whitehead (Middlesbrough) wins a free kick in the defensive half. Attempt saved. Kei Kamara (Middlesbrough) header from the right side of the box is saved in the top right corner. Assisted by Richard Smallwood. Richard Smallwood (Middlesbrough) wins a free kick on the left wing. Kei Kamara (Middlesbrough) wins a free kick on the left wing. Jonathan Woodgate (Middlesbrough) wins a free kick in the defensive half. Offside, Derby County. Chris Martin tries a through ball, but Will Hughes is caught offside. Attempt missed. Chris Martin (Derby County) right footed shot from the centre of the box is close, but misses to the right. Assisted by Craig Forsyth following a corner.